A Moroccan court has rejected an appeal against the prison sentences of activists who demonstrated against corruption and unemployment. 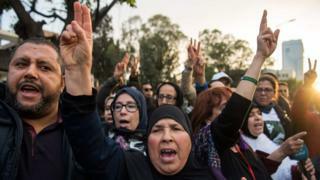 Dozens of people stood outside the Casablanca court demanding the prisoners' immediate release ahead of the ruling. The authorities have accused the activists of being separatists. Protests rocked the North African country in 2016 and 2017 after the death of a local fishmonger. Mohcine Fikri was crushed to death by a rubbish lorry in the city of Al-Hoceima as he tried to protect his fish, which had been confiscated by the police. His death in October 2016 prompted a wave of anger, with thousands taking to the streets accusing authorities of abuse of power and corruption. The so-called Hirak movement spread throughout the northern Rif region, and about 400 people were detained - drawing further demonstrations. In June 2018, courts sentenced the leader of the movement, Nasser Zefzaki, to 20 years in prison, with the same term for activists Ouassim El Boustati and Samir Ghid. Others were given sentences of up to 15 years behind bars. Now, the courts have rejected an appeal against the sentences. Relatives of those arrested reportedly chanted "corrupt state" and "long live the people" outside the court house once the decision was announced. Mr Zefzaki was a finalist in 2018 for the Sakharov Prize, which honours people who fight for human rights. A group of MEPs sent a letter to Morocco's justice minister on Wednesday urging the country to immediately release Mr Zefzaki and the other detained protesters.